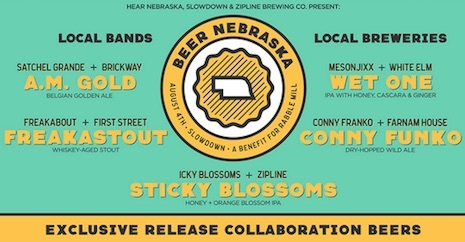 Lazy-i » Beer Nebraska set times (including Sticky Blossoms); Crease tonight; new Ron Gallo track..
Beer Nebraska set times (including Sticky Blossoms); Crease tonight; new Ron Gallo track.. The next pseudo music festival is this Saturday at The Slowdown — it’s a benefit for non-profit Rabble Mill, which, if you didn’t know, is the umbrella organization that houses good ol’ Hear Nebraska (Yes, Hear Nebraska still exists. In fact, they have offices in the Slowdown complex in a shared space with Saddle Creek Records and Maha Music Festival personnel). This benefit concert is a bit different in that it features both bands and beer — specifically five local breweries who have made exclusively released beers inspired by the performing bands. It’s weird and cool. Local brewers are Zipline (who’s co-hosting this even with Hear Nebraska), Brickway, Farnam House, First Street and White Elm. The inspired beer I’m most looking forward to is Zipline’s Sticky Blossoms, which is “honey plus orange blossom IPA.” Mmm-mmmm. According to the Facebook invite, beers will be served outside from 5 to 9 p.m. The beer-tasting ticket gets you five samples plus a commemorative glass. Tix here or at Zipline’s drinking room in the Slowdown complex. As mentioned proceeds go to Rabble Mill, which has a lot of exciting programs in the works, including music-related ideas that (hopefully) you’ll be hearing more about in the near future. Tonight, Omaha punk band Crease opens for Minneapolis screamo band Sleep Debt at Brothers Lounge. $5, 9 p.m.